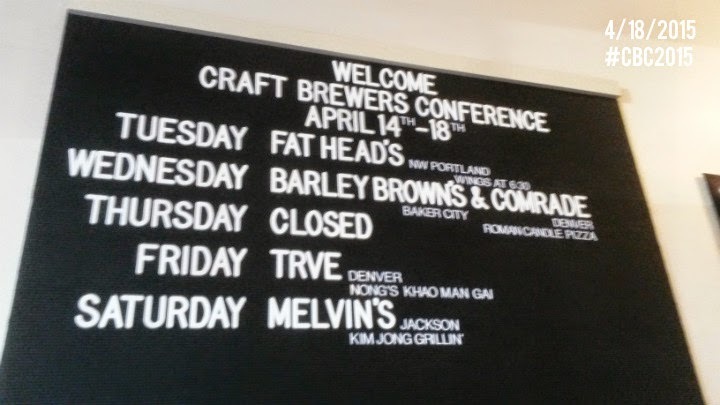 Last week, from April 14-18, 2015, the Craft Brewers Conference (CBC) reigned in Portland, Oregon. 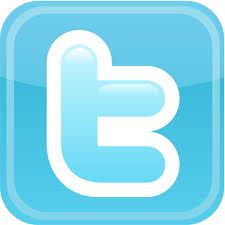 Thousands of visitors arrived from out of state, including all parts of the United States, Canada, Europe, and more. 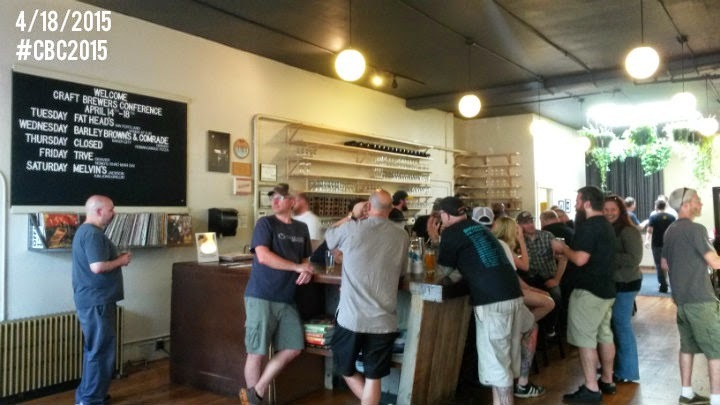 Many of Portland's beer hotspots reaped the benefits of some special, rare brews not normally found in the Rose City. 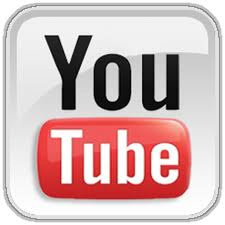 Here's a recap of some of the week's events! 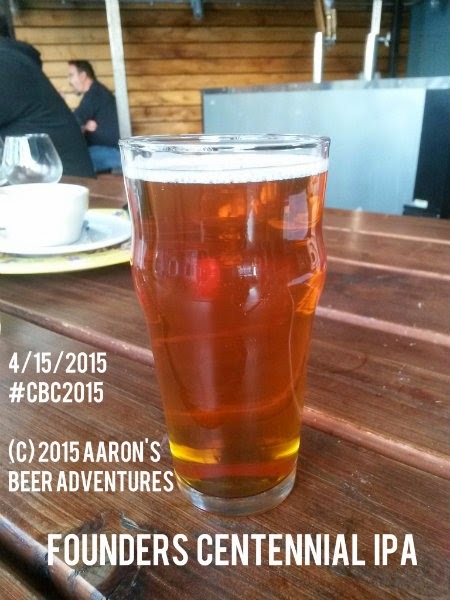 ****Note: Pictures will reference Aaron's Beer Adventures, basically my startup page devoted to beer reviews. 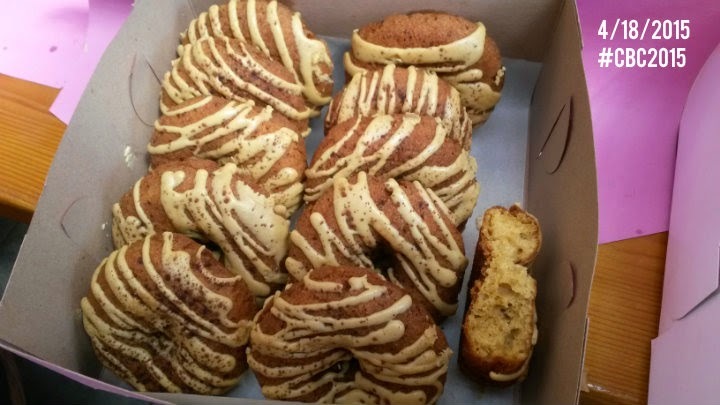 I just decided to post the article of the week's CBC festivities on my main food adventures page because, well, I also ate food along the way! In all honesty, the festivities actually started the week before. 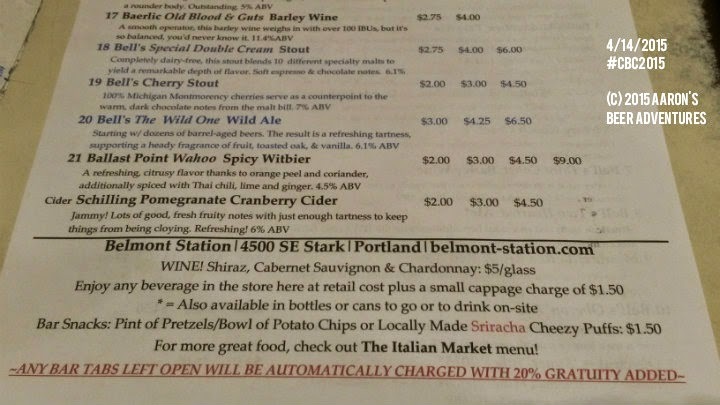 Belmont Station had for sale many beers that we don't otherwise get in the Pacific NW. 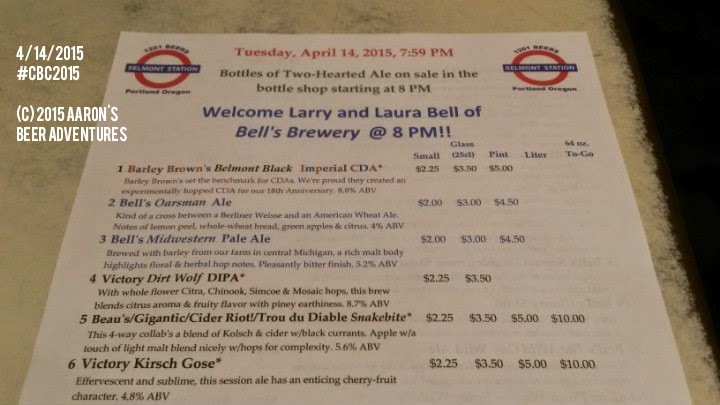 For example, Belmont Station brought in a few cases of Bell's Brewery Two Hearted Ale on Friday afternoon. While Bell's ships mostly to the Midwest, they have a very limited presence on the West Coast, only found otherwise in Southern California and Arizona as of this blog post. Despite a "one 6-pack per person" limit and a $11.99 price tag, all the 6-packs were gone in a couple hours. I was fortunate to snag one of the 6-packs. As you can tell by this glowing review I had for the beer, I will be enjoying and savoring every last drop from the other five bottles. 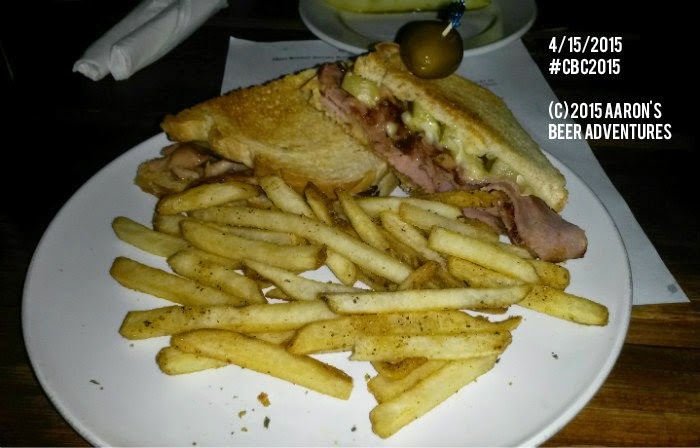 After mostly taking it easy on the weekend and through Monday, I went to The Upper Lip, a part of Bailey's Taproom, on Tuesday, April 14. 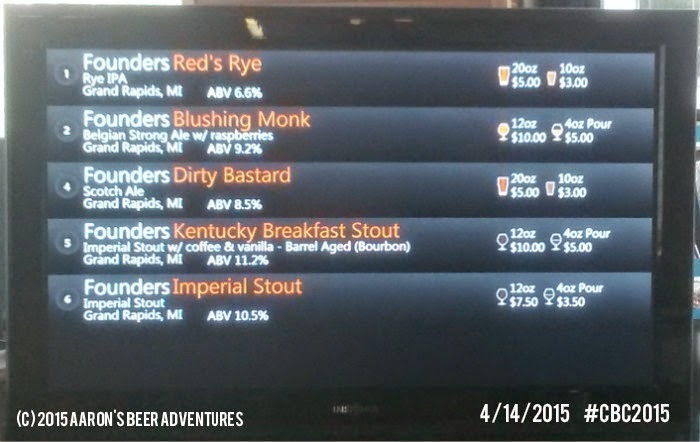 As part of the CBC, The Upper Lip served beers from Founders Brewing, another critically acclaimed Michigan brewery. By the time I got to downtown Portland around 6 PM, both The Upper Lip and Bailey's were packed. A security guard blocked entrance to The Upper Lip, likely to ensure the capacity of the room did not exceed what was legal for local ordinances and codes. The line did steadily move, and I got in after roughly 10 minutes. 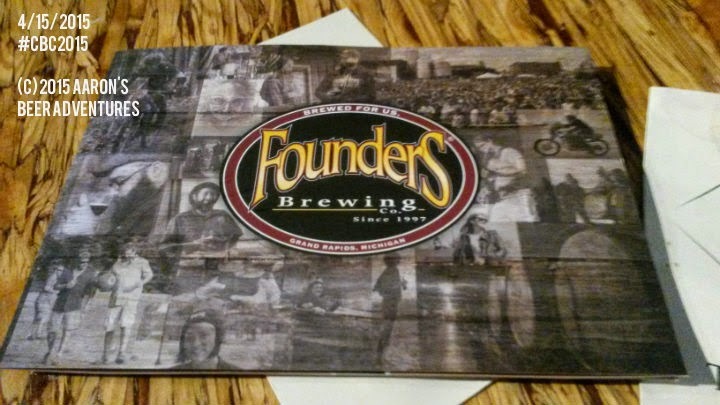 Five Founders beers on tap, including the much-sought-after Kentucky Breakfast Stout. 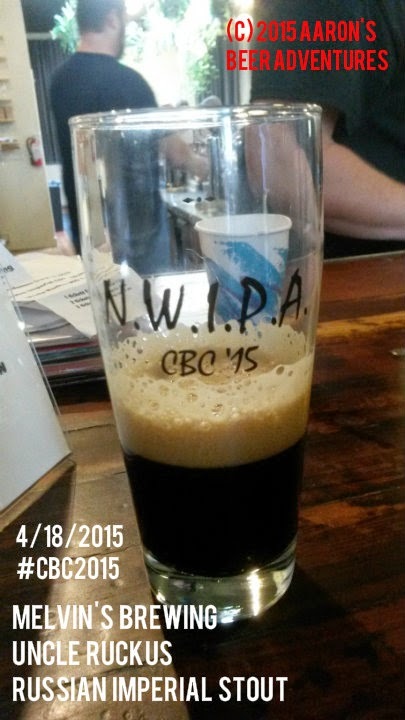 I thought the KBS was wonderful, but probably a tad too alcoholic for my nature. 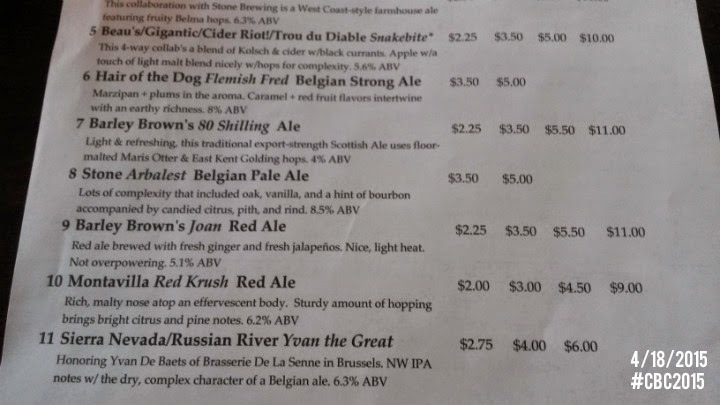 The Founders Red's Rye IPA was hands down my favorite that night. Refreshing, smooth, and extremely balanced. 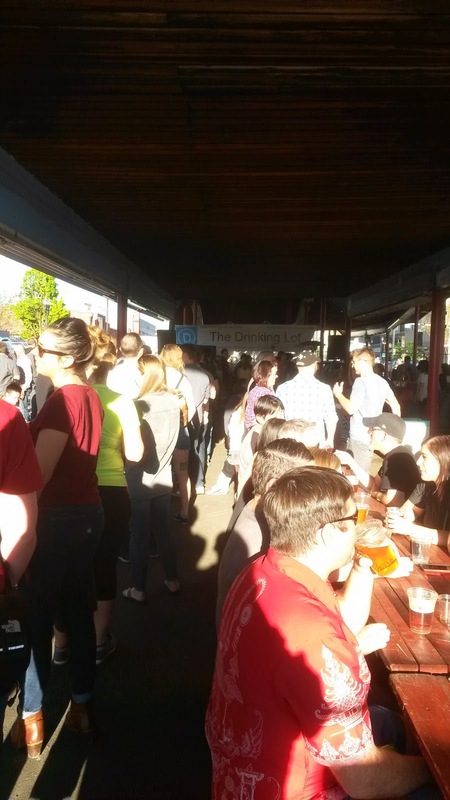 I attempted to get down to Belmont Station for their Bell's Brewery Tap Takeover, but even at 9 PM, the line was ridiculous. 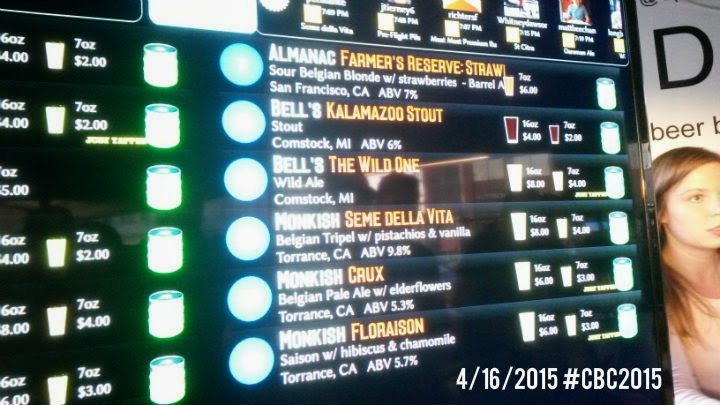 Forty-five minutes to wait for a Bell's beer? The panda elected to grab a 22 of Fort George Omegatex and headed home. After making it through work, Tax Day basically started at Apex. 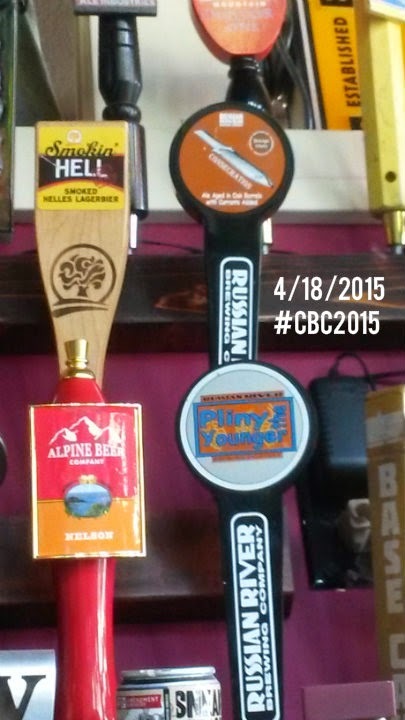 Featured breweries included 3 Floyds Brewing (Indiana), Surly Brewing (Minnesota), and Sun King Brewery (Indiana). Huge thumbs up for Surly's Todd the Axe Man IPA. 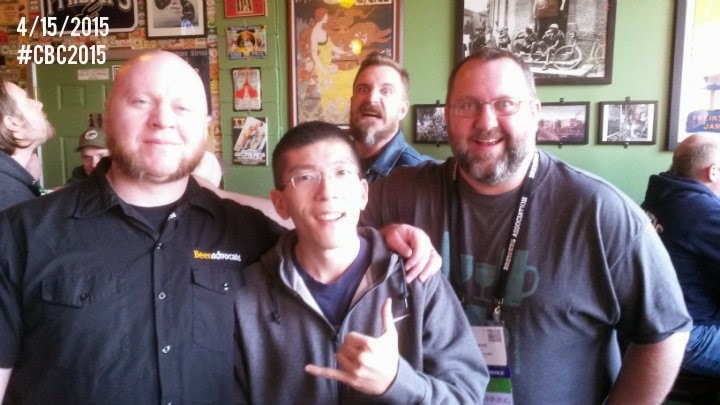 In what was simply right-place-right-time awesomeness, I met and chatted with representatives of BeerAdvocate. 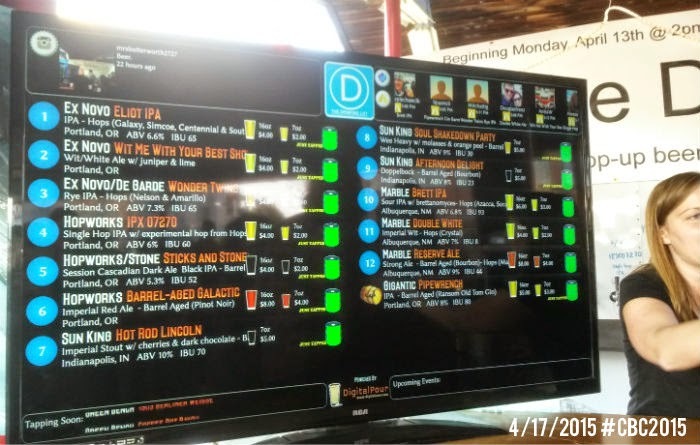 As you may have seen (and will continue to see) on this article, a few of the links will go to BeerAdvocate, so that's basically how much I use that site. 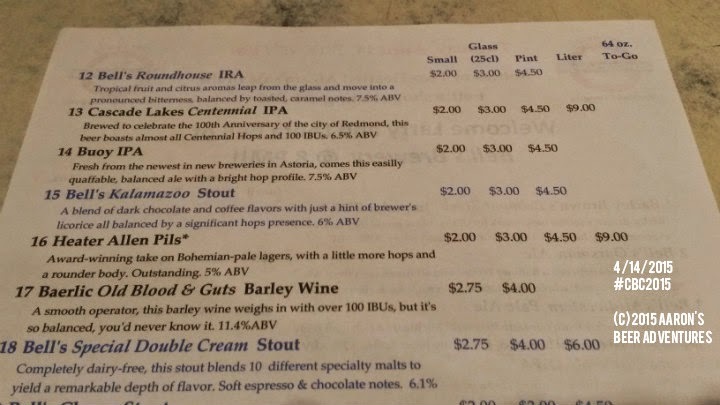 My beer review blog uses almost the exact same formula to rate beers. And yes, I got a picture with the bros, Jason and Todd Alstrom! Extra points for the photobomber! 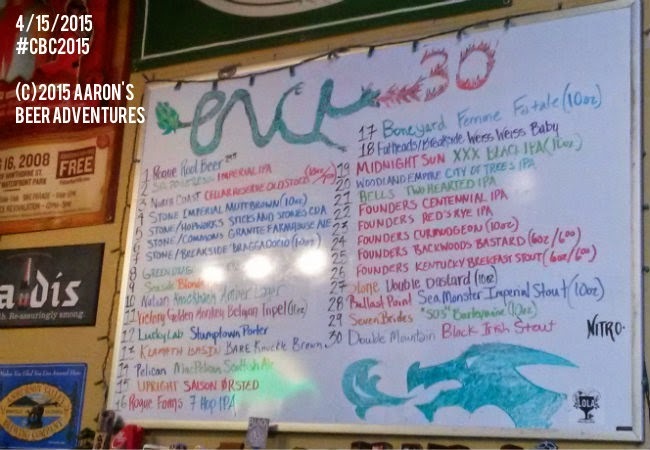 I moved on to Green Dragon, just off SE 9th and Belmont, where Founders again did a Tap Takeover. 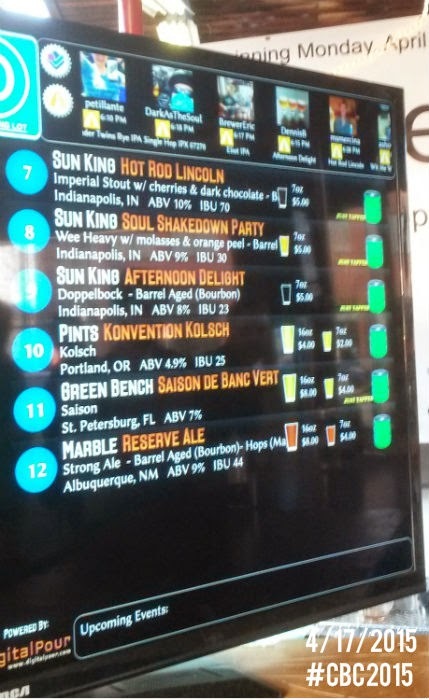 Again, KBS was on the taplist. 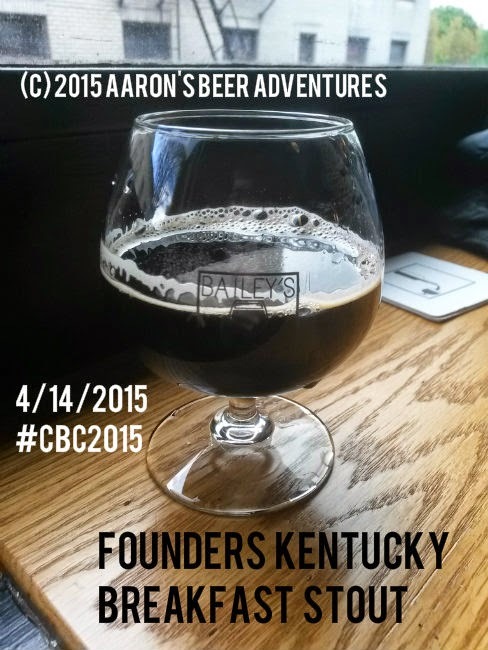 Again, KBS was the first Founders beer to kick. 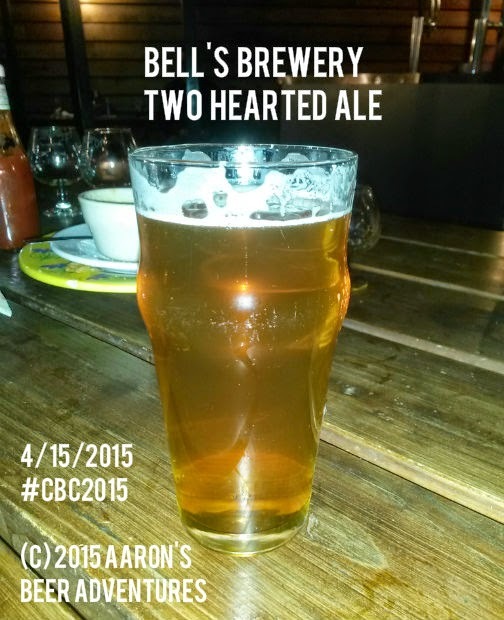 This time, I got the Founders Centennial IPA and another helping of Bell's Two Hearted. Both hit the spot. 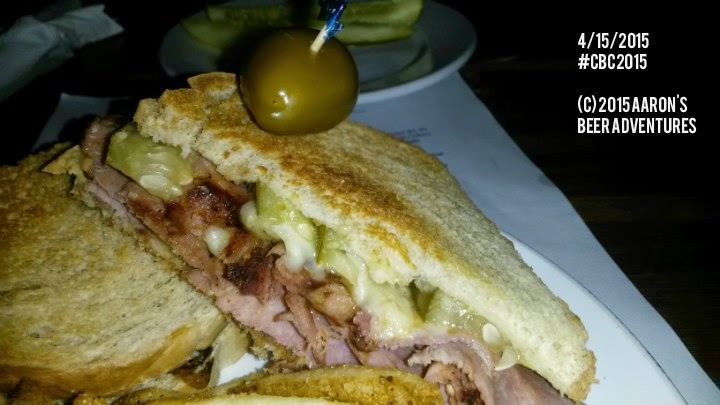 As for food (because panda have to eat), I got their take on a Cubano -- really ham, cheese, pickles, and mustard. Good food for what it was, but nothing truly mind-blowing. Tonight, it was all about The Drinking Lot, a popup, gated-off beer area put on by Bailey's Taproom. 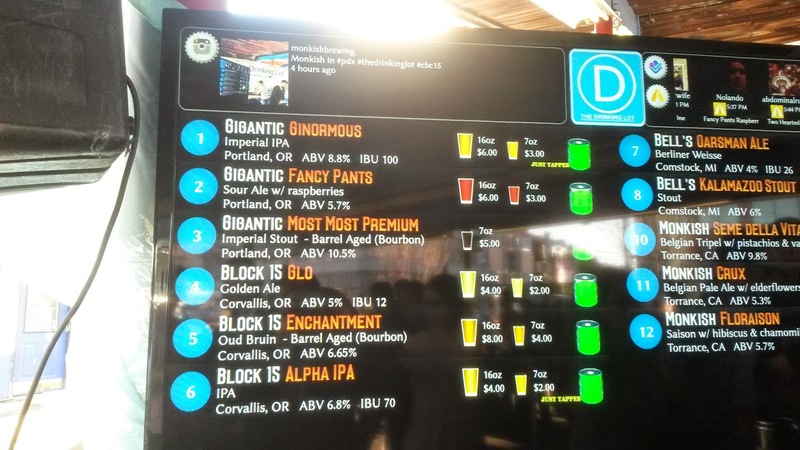 It was located at the corner of MLK and E Burnside.Throughout the CBC, The Drinking Lot rotated a dozen taps, some local and some rare out-of-state brews. 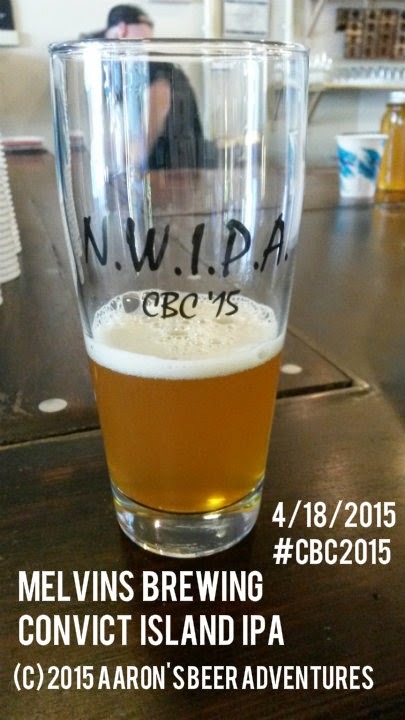 Needless to say, the CBC attracted a very long line at The Drinking Lot. 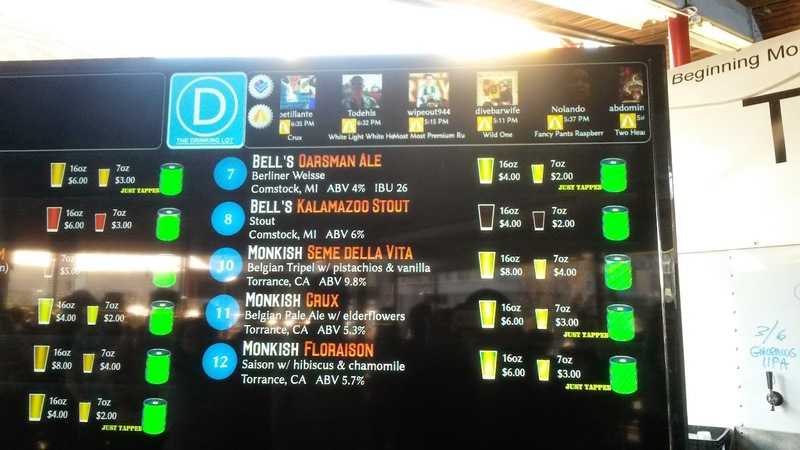 Michigan breweries must have really struck a chord with me or something, because again Bell's Brewery had a couple of beers going on this night.I'm usually not a big fan of stouts, but Bell's Kalamazoo Stout was quite good. Switching to the West Coast, I got the Almanac IPA from Almanac Beer Co. Amazing citrus aroma and flavor. My friends at Pulehu Pizza rocked some good food as I basically people-watched, chatted with random people, and drank some quality beer. Although the place only stayed open until 10, I was one of the last to leave. Too much fun chatting with old (and new) friends. More Drinking Lot fun! Like the panda could successfully stay away with all the beautiful weather that hit Portland. Not a chance. 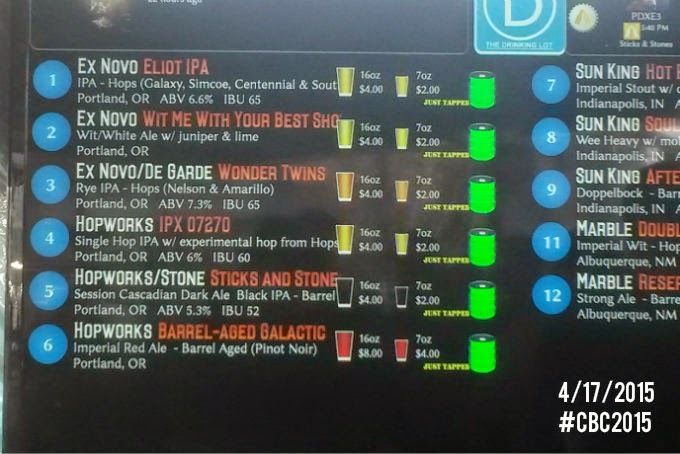 On Friday, I saw beers from Ex Novo Brewing (Portland), Hopworks Urban Brewery (Portland), Sun King (Indiana), and Marble Brewery (New Mexico). 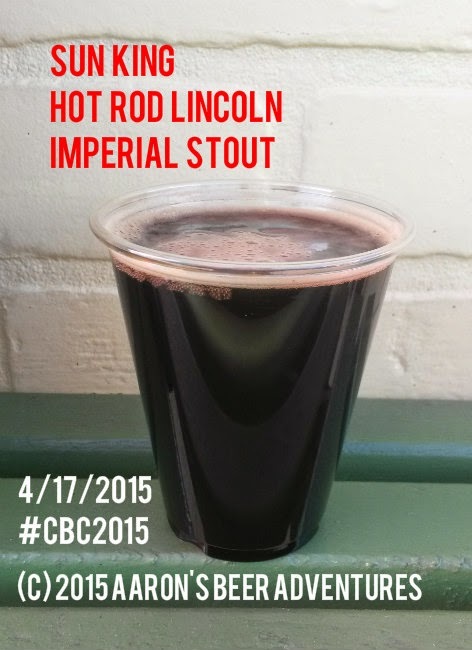 First up, Sun King's Hot Rod Lincoln, an imperial stout with cherries and dark chocolate. It packed a good punch at 10% ABV, but again good overall. Certainly bitter. Got the cherries more on the smell than in the taste. At the same time, I got Ex Novo's Eliot IPA. Wonderful citrus/tropical aroma, much maltier on the taste than I anticipated. Still refreshing and wonderful. 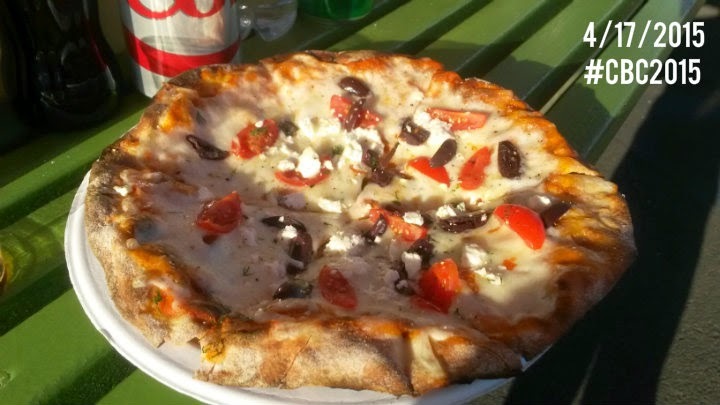 During my pizza break from Pulehu (Greek pizza, anyone? 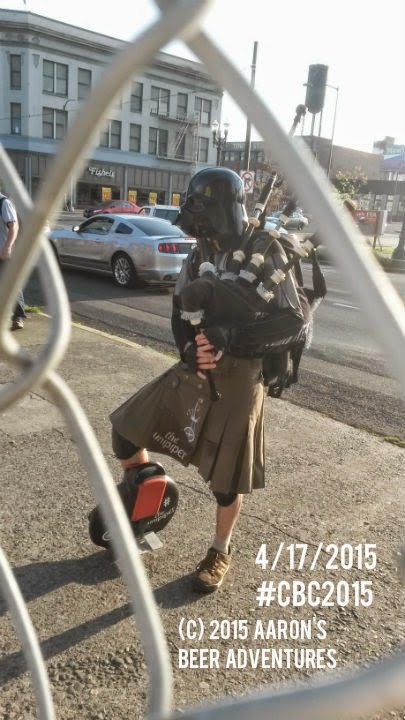 ), Portland's famous Unipiper showed up for some entertainment. 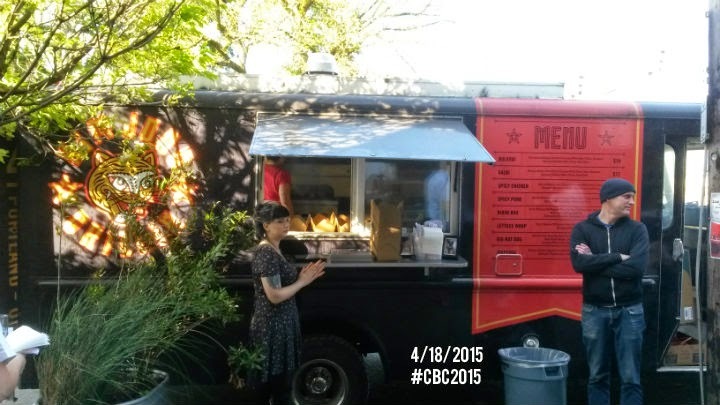 He also went inside to get his CBC food/beer fix before taking off. 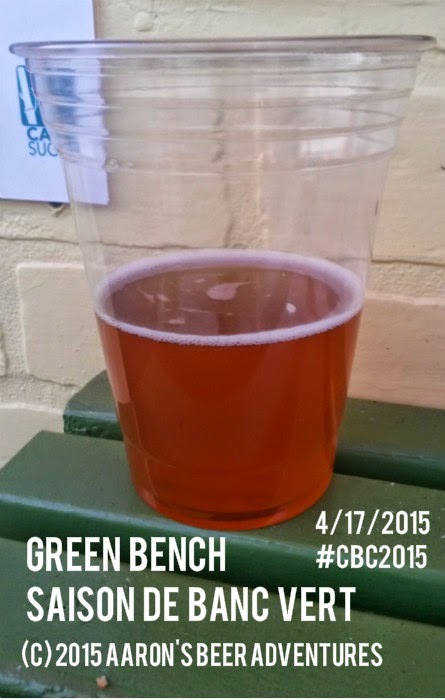 I checked the taplist later in the night and saw Green Bench Brewing's Saison De Banc Vert on there. Not bad, but not used to what I can only classify as a funkier aroma and taste. While saisons are really not my thing, I still drank the pint -- mainly because it might be the last time I see it for a while. 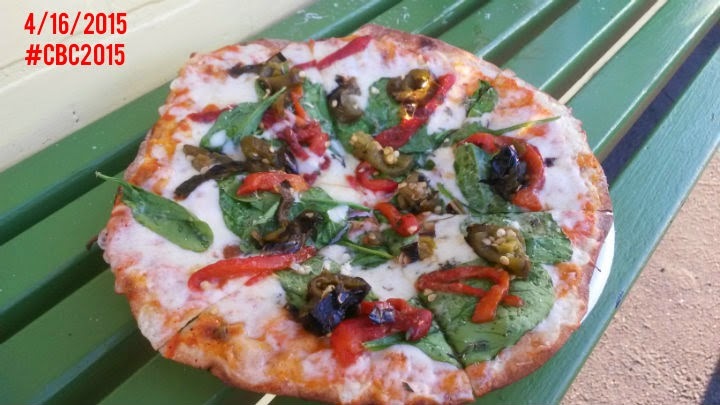 Pulehu Pizza got another day's worth of amazing business, even running out of pizza in the process. For a couple hours, they became a sausage cart. The Black Pepper & Garlic sausage from Sheridan Fruit Company is a winner. 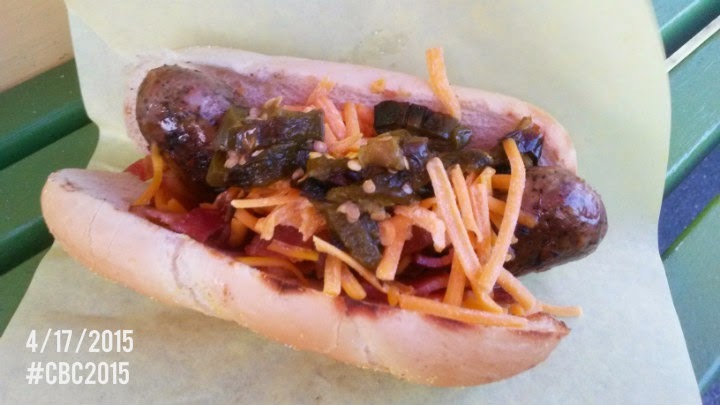 Top it with some cheese and charred jalapenos. Once again, I went home after The Drinking Lot closed. 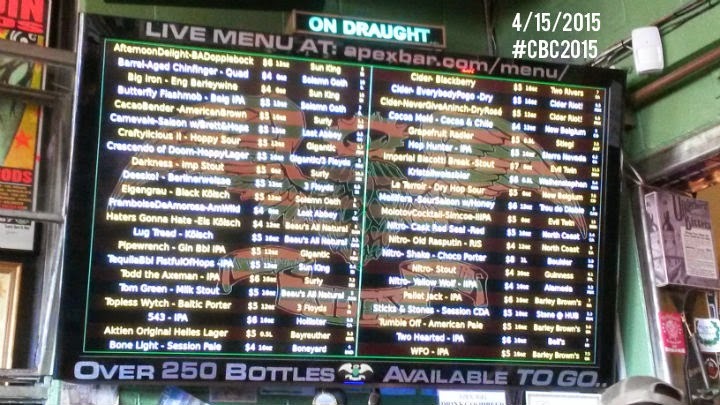 The last day of the Craft Brewers Conference actually started at Pepper Box Cafe. 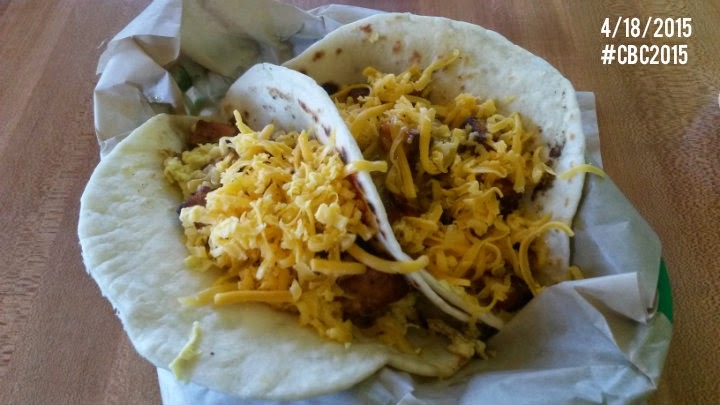 Breakfast tacos to fuel my day -- and the amount of drinking ahead. I decided to start at Apex and work my way east. Compared to the insane crowd and long lines the previous few days, Apex today was a virtual ghost town. Probably 5-6 people at noon enjoying a beer. No wait, and still a number of beers from the previous night. 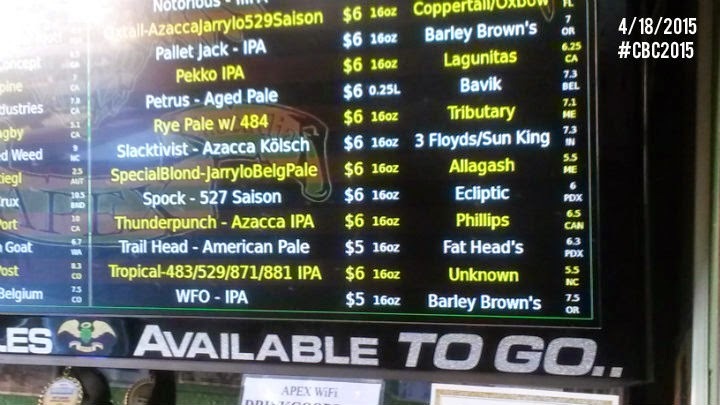 Just FYI, a number of those Friday Apex beers were made with dwarf hops. 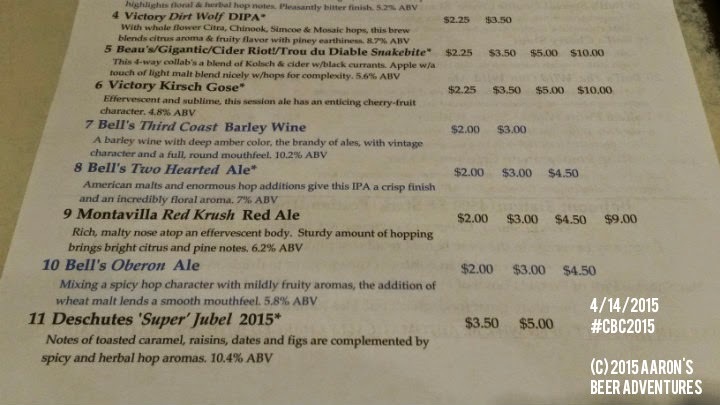 Check the American Dwarf Hop Association for more info there. 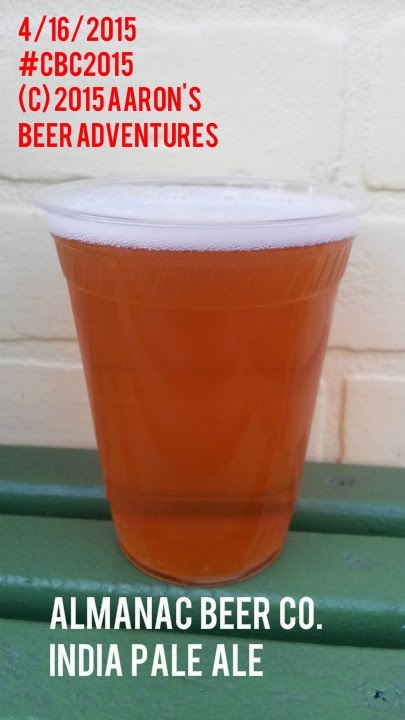 My first beer from North Carolina was the Tropical IPA from The Unknown Brewing Co. This beer, made with those new and experimental dwarf hops, was damn good. 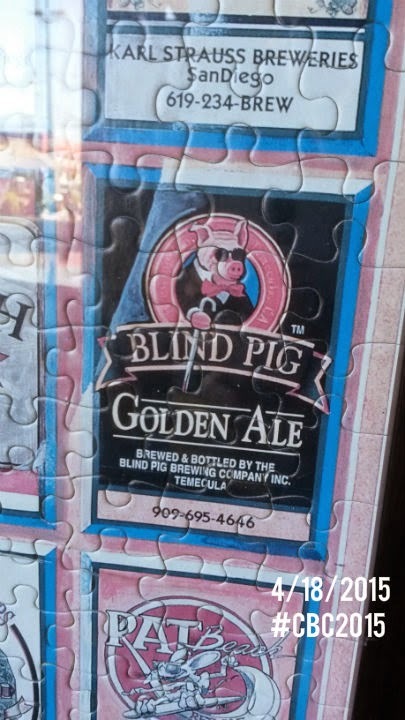 I'm still fairly new to the craft beer scene, so I had no clue that Russian River's Blind Pig IPA spawned from the now-defunct Blind Pig Brewing Company based in Temecula. 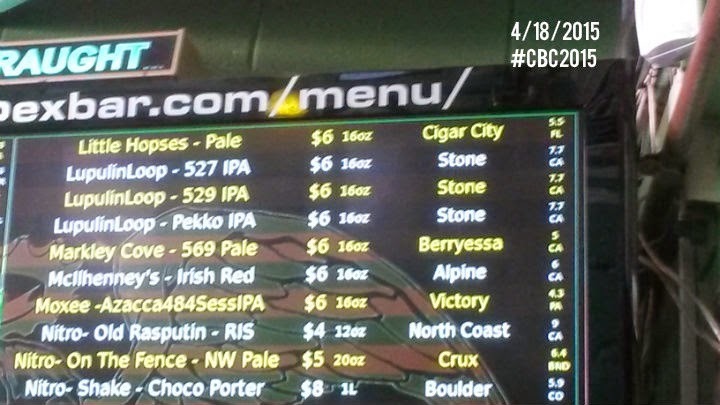 With other beers from Cigar City Brewing (Florida), Phillips Beer (Victoria, BC, Canada), Surly Brewing (Minnesota), and Post Brewing (Colorado), I could have stayed there until tipsy panda mode set in. Instead, I ventured to my next destination. 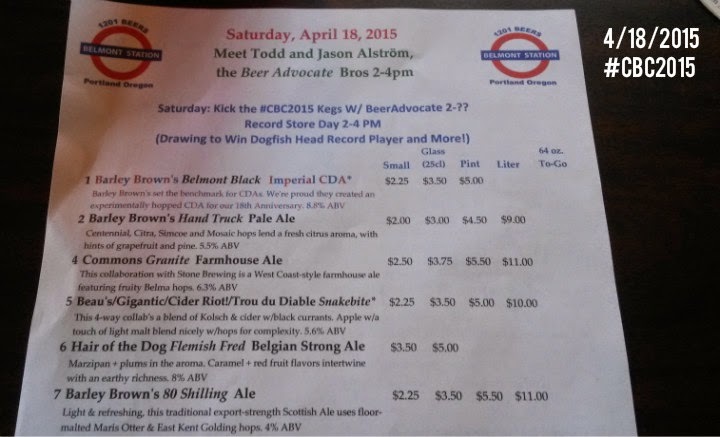 At 2 PM, Belmont Station started kicking some of the partial kegs with the BeerAdvocate team. 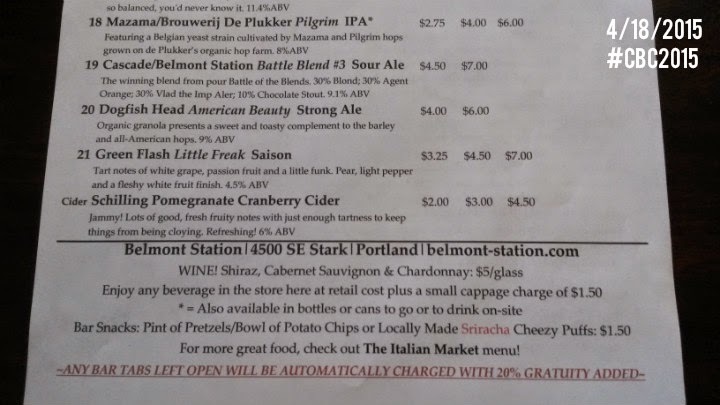 After talking with a Belmont Station staff member, I found out there were at least 70 partial kegs remaining. 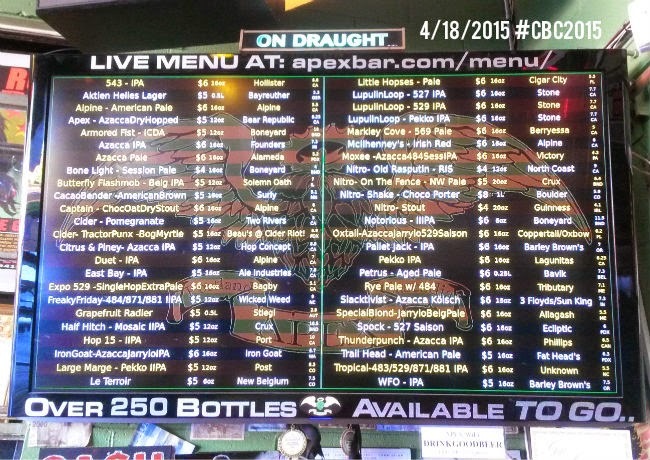 They will need a good amount of time to finish all the kegs off. 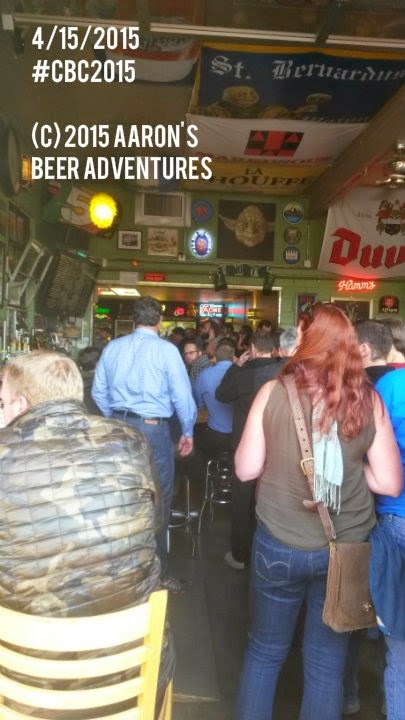 Also, if you looked on the wall, you'd see the tap handle they use when Pliny the Younger arrives (usually in late February to early March in Portland). 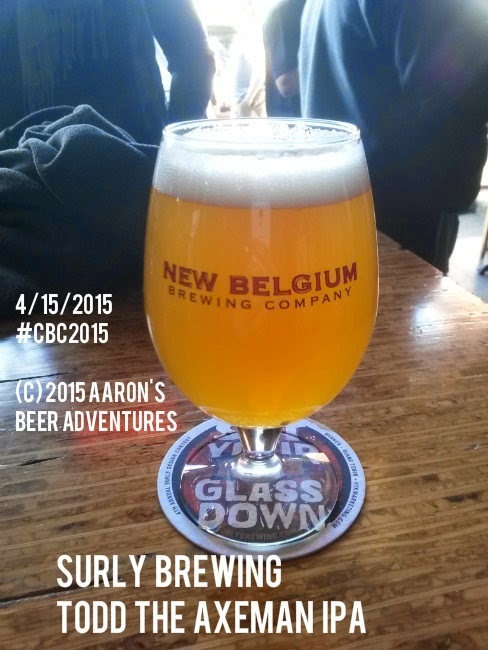 Had a glass (25 cL) of Yvan the Great, a beer collaboration from Sierra Nevada and Russian River Brewing. A NW IPA meets a Belgian Ale -- although I got more of the Belgian part here. 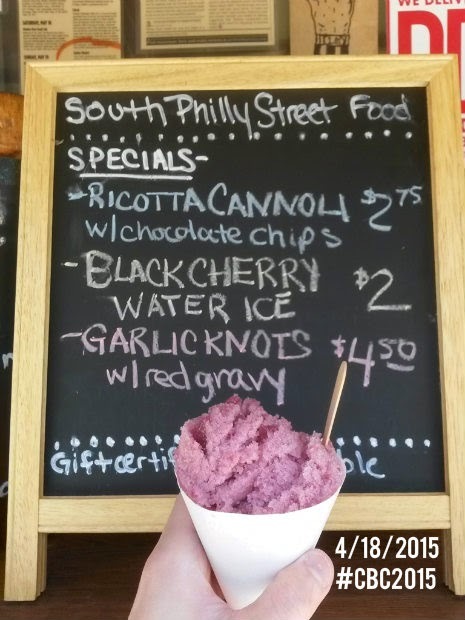 Went to The Italian Market food cart -- set up on site at Belmont Station -- and got some Black Cherry Water Ice. On a sunny day where we hit the high 70s, water ice will totally hit the spot. 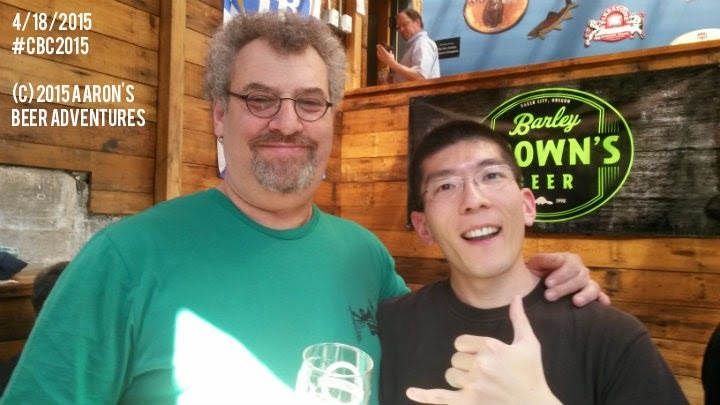 I even met Alan Sprints, head brewer and founder of Hair of the Dog Brewing. 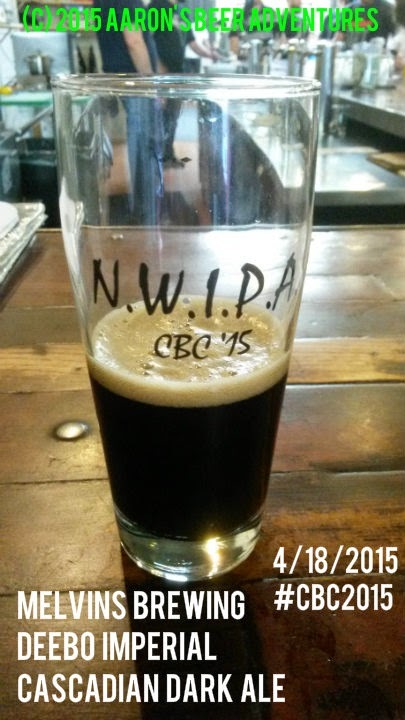 Earlier in the day, there was a "Coffee Beer and Doughnuts" brunch event at Culmination Brewing. 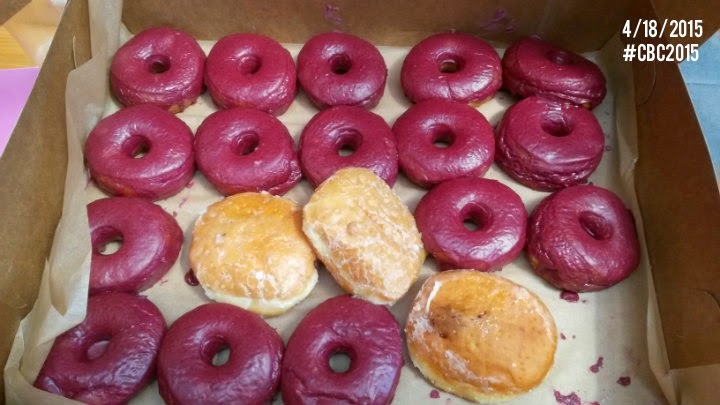 The leftover doughnuts came to us. Engage happy panda mode. 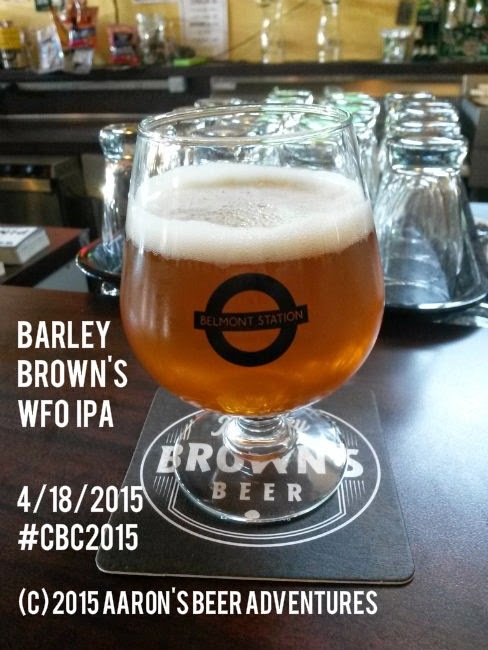 Third beer of the day was a glass (25 cL) of Barley Brown's WFO IPA. Another gem from this acclaimed brewery. Balanced, citrus-tropical refreshing, and easy to drink. 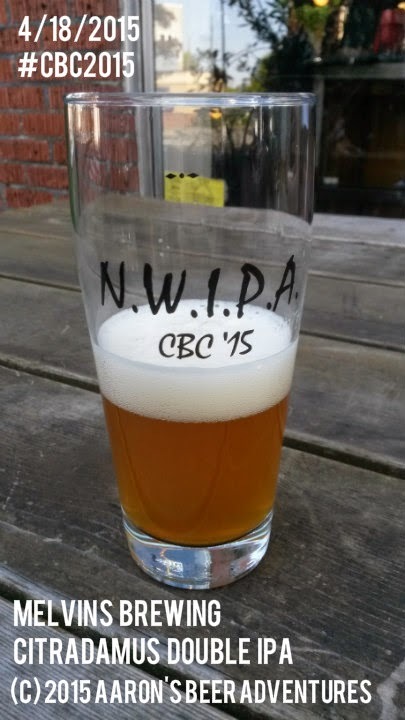 To finish off the night -- and a kickass CBC -- I ventured to NWIPA on SE Foster to try beers from Melvin Brewing (Wyoming). 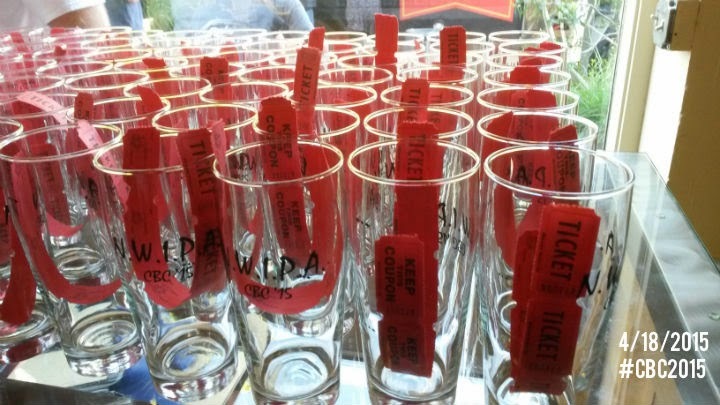 For $10, people got a commemorative pint glass and five tickets for beer. Each ticket was good for a 4 oz. pour, and you could get up to 12 oz. at a time (three tickets). First off, I'm very happy that I got there right at 5 PM. 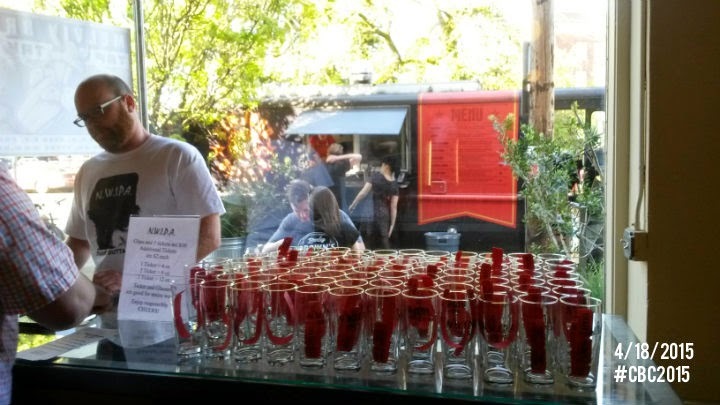 The event had likely barely started, and there were already a boatload of people enjoying the beer. 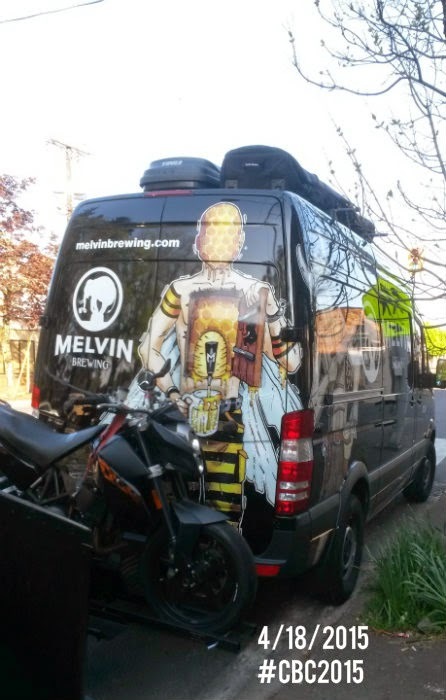 All five Melvin's brews on tap that night -- including two kegs of the award-winning 2x4 Double IPA -- wouldn't last 90 minutes. I elected to work my way up the beer chain and got 4 oz. 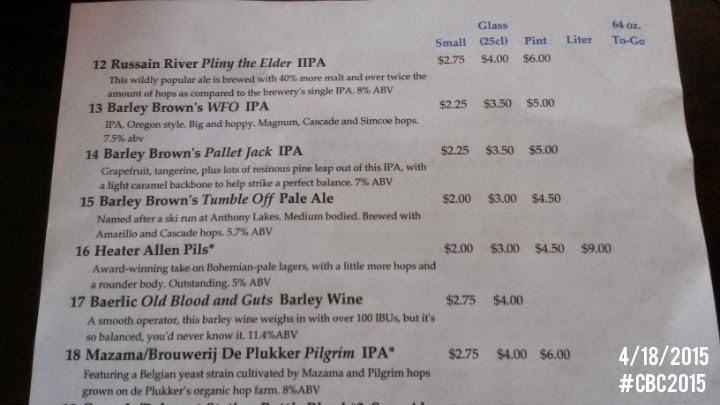 of each beer, starting with Melvin's Convict Island IPA. This one turned out to be my personal favorite. 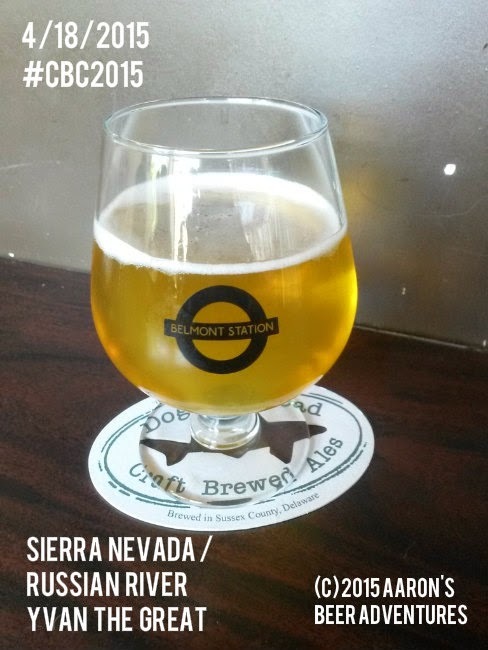 Balanced, citrus-hoppy, delicious. 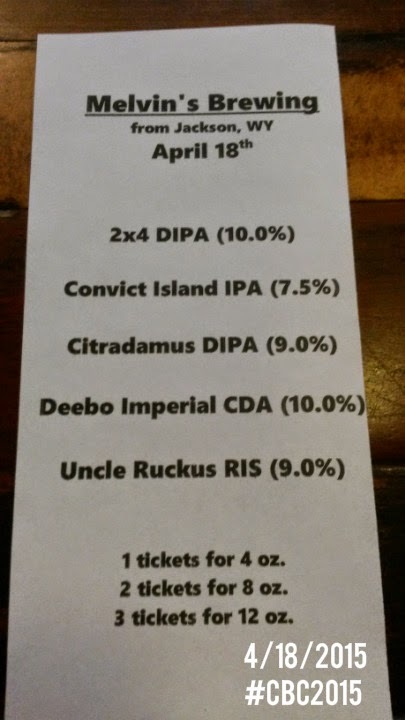 Citradamus Double IPA was next. 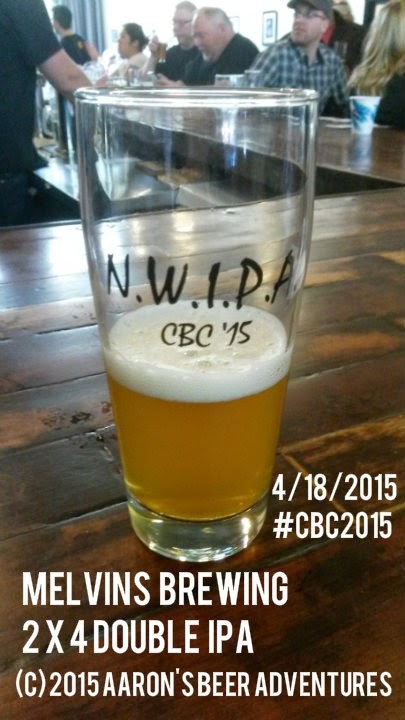 From what I gathered, it was a new beer brought up for CBC 2015. Nice Citra presence and very tasty. 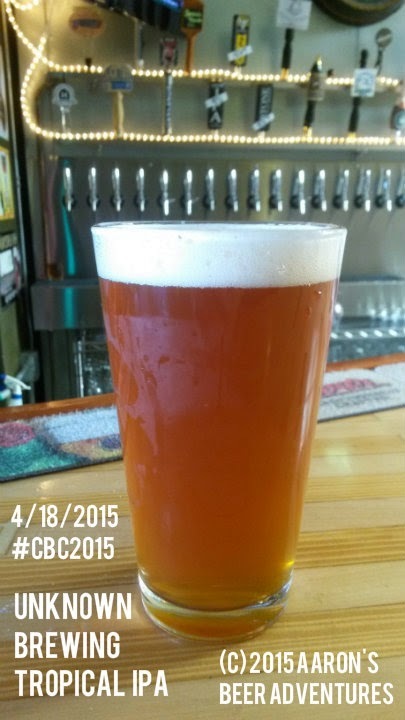 Third was the much-lauded 2x4 Double IPA. No shortage of praise on this one. 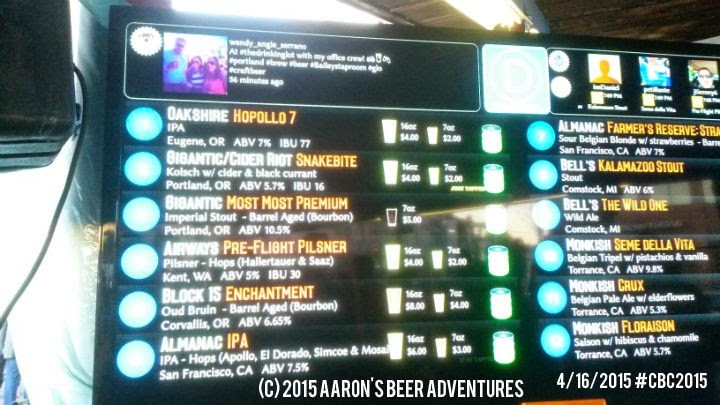 Reviewers on BeerAdvocate and Untappd all but put it at world-class level. While I also appreciated the piney and citrus experience, I personally lean more towards an IPA or Double IPA that remains in the single digits for ABV. At least, that way I can drink more of it and not get ridiculously smashed. Han of Kim Jong Grillin' was back slinging more of his award-winning Korean food. 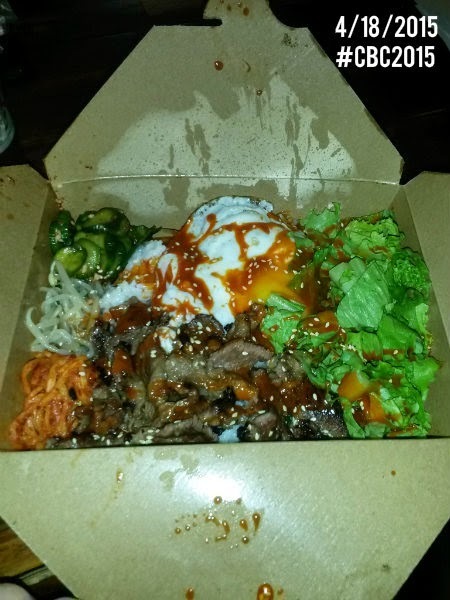 The Bi Bim Box with Bulgogi is my personal favorite here. Hands down some of the best Korean food I've had. 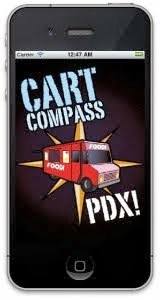 Definitely worth the trip if you're visiting Portland. Back to the beers. 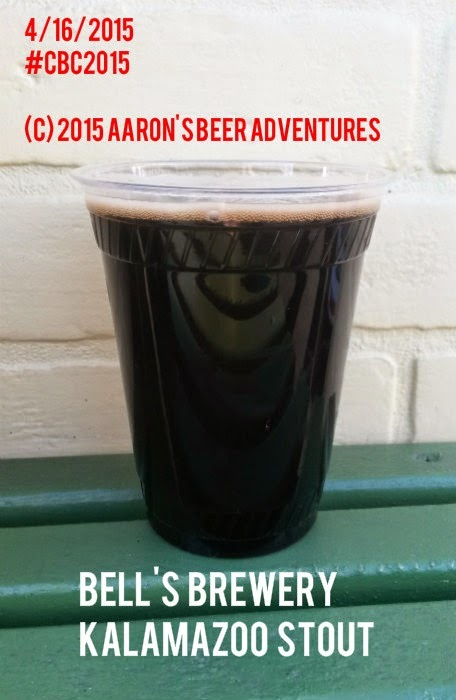 I tried the Deebo Imperial Cascadian Dark Ale for science. Wonderful hoppy aroma with a maltier, roasted experience. Last but not least, the Uncle Ruckus Russian Imperial Stout. Chocolaty, roasted, full-bodied, and again very flavorful. Might cause beergasms or persuade people to become stout lovers. 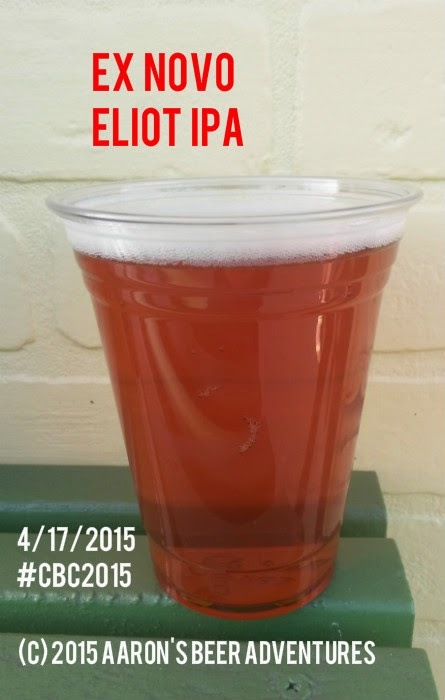 For those wondering, the 2016 Craft Brewers Conference will be in Philadelphia. 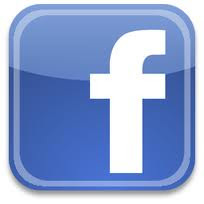 May 3-6, 2016! Considering I've never been to Philadelphia -- and want to try as many Philly cheesesteaks as humanly possible -- I plan on attending this conference. 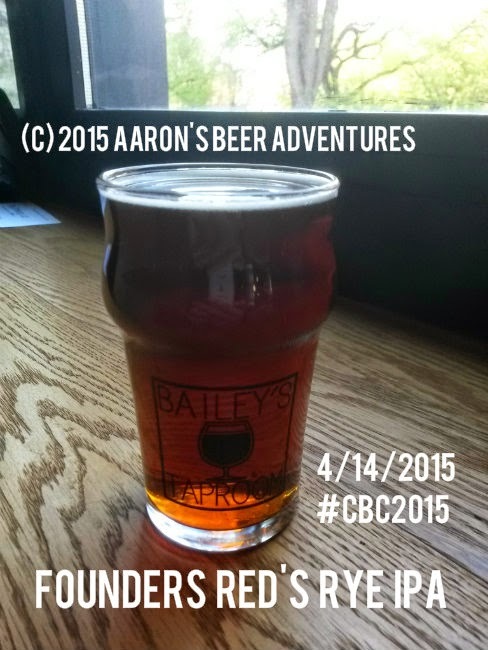 So there you have it, five days of drinking various beers and numerous photos to memorialize the occasion. While I initially promised myself that I would hold out and "cleanse" as long as possible before enjoying my next beer, that basically lasted 36 hours. The reviews for my beer blog must continue for science.